Astronaut Alfred M. Worden, command module pilot, checks the connections to his suit during suiting up operations in the Kennedy Space Center's (KSC) Manned Spacecraft Operations Building during Apollo 15 prelaunch countdown (41407); Three Apollo 15 astronauts go through suiting up operations. They are David R. Scott (foreground), commander; Worden (center), command module pilot; and James B. Irwin (in background), lunar module pilot. 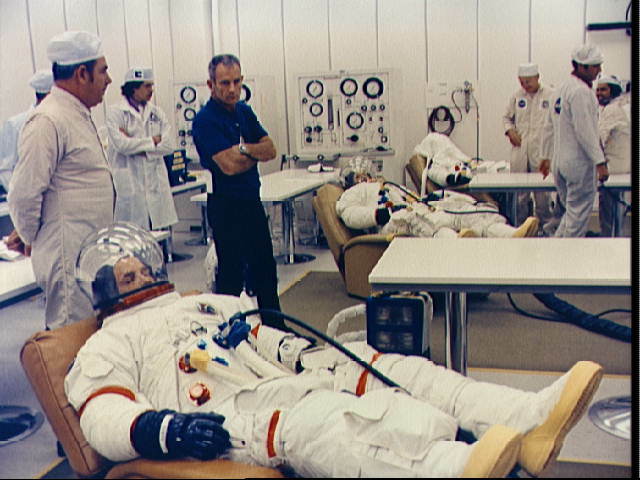 With the crewmen was Dr. Donald K. Slyaton (wearing dark blue sports shirt), Director of Flight Crew Operations, Manned Spacecraft Center (41408); Scott goes through suiting up operations at KSC during prelaunch countdown (41409); A suit technician assists Irwin as he goes through suiting up operations during prelaunch countdown (41410).